Ever since I can remember I have been obsessed with our equine friends. Early on, in childhood I had the fortune of being offered the opportunity to learn to ride at the Centre of Equestrian Training of the Greek Cavalry. 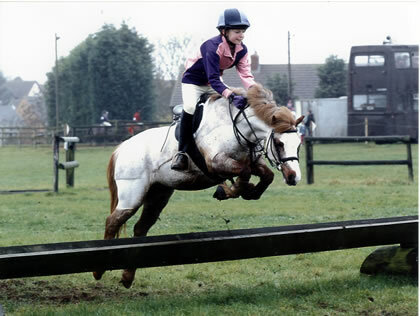 Having spent most of my teenage years training and competing with their junior show jumping team in club and national competitions I was encouraged by Leeson Sirett (F.E.I. Showjumping course builder) to come to Britain to further my training and experience. I trained as a working pupil at Patchetts Equestrian Centre and achieved firstly my BHSAI and soon after my BHSII. My deepest gratitude goes to my early mentor and coach Wendy Hawkes who imparted her vast and valuable knowledge and experience and supported me through many years at Patchetts Equestrian. While working at Patchetts as an instructor and manager, I was also able to extensively compete in show jumping, Dressage and Eventing. The great number and quality of horses at that yard allowed me to develop a broad spectrum of experience and the ability to deal with allsorts of people and their horses. I’m very proud to have been part of what was one of the best training yards in the country. Since 1998 I have worked freelance, coaching riders and training horses at all levels of experience and ability. It gives me great pleasure to see riders and horses realize their ambitions, no matter how modest or extravagant these might be. I always encourage riders to be patient with their horses and to set realistic goals, creating sound foundations that they can build on gradually over time, enabling their horse to develop both the physical ability as well as the confidence to perform at their best. My interest in assisting riders to develop has led me to further study with the Open University and I have now completed my BSc Honours Psychology. This experience has been a valuable asset in coaching as it has enhanced my understanding of human nature and I have been able to apply this knowledge in appreciating the complexity of the relationship with our equine friends and the sort of issues that sometimes hold us back. My postgraduate study has taken me to to the field of Philosophy, attaining my PGC Humanities, using this to reflect on our philosophy of coaching riders and training horses. My daughter, Annie, is in year 7 at St George’s and rides at Redbourn Riding School. We’ve asked her form tutor about the equestrian team at St George’s, but she hasn’t been able to give us much information. We would love to find out more, please. Hi Elizabeth, we have a team going to a show jumping competition at Bury farm equestrian on Sunday 19th. I will also add your email address on our mailing list so you get all updates on any activities we do in the future. Feel free to call me to discuss, my contact details are on the website. Hi just enquiring about any future jumping clincs you have and what the prices would be, we ate based in Barnet. I attended the clinic at great Westwood on Saturday and my horse was Oscar, the ex racer. We had a great time and I just wanted to know when and where your show jumping clinics are and any other cross country clinics. Please do let me know and I look forward to many more days like Saturday! Turners Hall show jumping clinic is on Sunday 19th in Wheathampstead. I’ll text you with details. I am currently on the search for a 1 to 1 coach that can travel to my yard and can focus more on showjumping. If this is something that you accommodate I would be interested to know your rates, I am based in radlett. I have emailed you in reply. It would be great to meet you and your horse.